Section headings and selected papers: Plenary Papers. 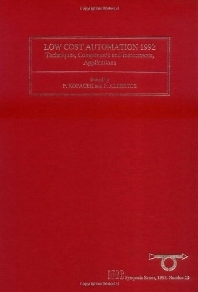 Low-cost factory automation (P. Kopacek). Theory. Regulating characteristics of exact model matching (K. Ichikawa). Signal Processing. Low cost signal sampling using local integrals (M.D. Van Der Laan et al.). Modelling and CAD. A guide to the design of a digital controller (R. Caccia, A. De Carli). Sensors. Sensor actuator to control the temperature effects into a system based on a quartz crystal (J. Arguelles et al.). Adaptive Controllers. A PC-based real-time generalized predictive controller (A.P. De Madrid et al.). Robotics. A low cost production line inspection system (K. Warwick et al.). Process Control Applications. Application of variable-structure control to air-conditioning systems (N.E. Gough et al.). Intelligent Controllers. Self-organizing fuzzy controller with neural network (L. Juri&scirc;ica, M. Sedlacek). PLC Design. Real-time supervision by a Grafcet algorithm (R.F. Garcia). Computer Systems. Intelligent fault diagnosis of the ICATS (Xu Lina, Deng Zhenglong). Drivers. Comparative study of dedicated motion-control processors (E. Bertran et al.). Applications (Miscellaneous). Supervision issues in semiautogenous grinding (A. Cipriano et al.). Author index. Keyword index. The main aim of this symposium was to bring together end-users and control system specialists to evaluate the possibilities for improvement of techniques, design procedures, components and instruments to encourage low cost automation; considering not only economic aspects but also improvements in productivity, reliability, flexibility and ease-of-application. Special emphasis was placed on small and medium sized enterprises. The technical sessions dealt with topics from process automation as well as from manufacturing automation.